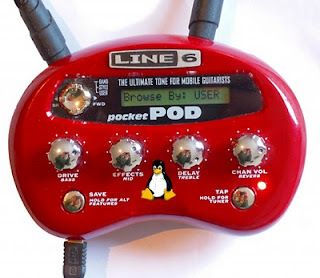 One of the cheapest and best known options for guitar multi-effects is the Line 6 pocket pod. It's been around for a while and I'm not going to review it, except to say it produces sounds and like any modeller it gives you the option of trying out different tones. What we're interested in here is that it can be tweaked from your computer via USB. There are reasons you might want to do this other than just geekery. One is that the Pod's four dials are all dual function, but can only be in one position at a time. This means if you set the delay level then try to tweak treble the treble is changed to whatever position the dial was at. Even if you don't find that annoying, using a computer lets you see where all the settings are at once, tweak them independently and also change things that you can't change with just the dials. I also find it handier to set the Pod down and adjust things via the computer than pick it up and fiddle with knobs. You can now start Vyzex from the Applications - Other menu. I could stop writing now, but some people object to Wine and having to use Windows apps. Also open source options give you scope to do things the original designers didn't foresee. What are the options? Go to Window - Preferences, check the Midi tab, that Midi is enabled and POD is selected for input and output. 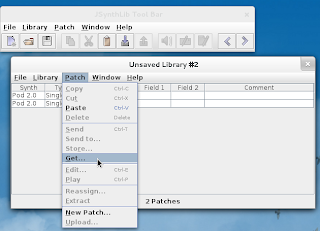 Select Patch - Get then in the new window 'Get' followed by 'Done'. This is the weakest point, it looks like it should be possible to import all the presets at once like the Vyzex software can, but actually you'll only get one preset at a time. If you're worried about overwriting the presets then select the 'Edit buffer' driver when choosing the patch. 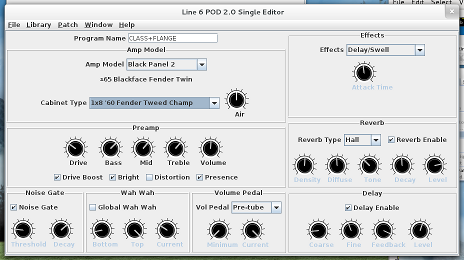 Right click on any patch and click 'Edit', this will bring up all the knobs you can tweak and they'll update the Pod in realtime. I'm sure someone with some Java Swing experience could easily improve on it a bit.